Wholesale T-shirts, tank tops, polo/golf shirts, hoodies, ladies shirts, youth T-shirts and other blank, printable apparel is what we offer. We are your wholesale source for blank T-shirts in bulk for printing, embroidery, tie-dye etc. We are constantly adding new products so check back often. Our most popular categories are T-shirts, golf/polo shirts, hoodies and ladies apparel. We strive to make your wholesale T-shirt ordering experience as easy as possible. If you are just looking for basic T-shirts, we have a page that just lists our wholesale basic T-shirts. Other, non T-shirt products that we have recently started to offer at wholesale include socks, hats, athletic shorts, sweat pants, aprons, and tote bags. We know you will find our site easy to navigate and shop. We've been in the wholesale t-shirt business for over 20 years and we are always finding new ways to make your buying experience easier based on user feedback. We now offer free chat support Monday through Friday from 9am to 4pm Mountain Standard time. When chat is available, you will see a green tab in the bottom right corner of this page. So far the response has been very positive. Why Choose Us for your Wholesale T-Shirt Needs? Complete Selection - We carry a wide variety of Wholesale T-shirts, Polos, Ladies Apparel, Youth Apparel and more. Easy Ordering - Order Shirts online 24/7. Our product category pages are easy to navigate and the individual product pages are full of detailed color samples and other helpful information. 100% Secure Ordering - JonesTshirts.com uses 128-bit encryption key over Secure Socket Layer (SSL) to provide the highest level of security. SSL provides encryption between web browsers and web servers. Solid History - We have been making customers happy since 1992. Read what customers are saying. Click HERE. 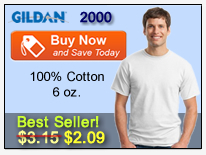 We make it easy to buy wholesale T-shirts. We do not require setting up an account and you do not need to provide a tax ID or business license. Our goal is to make it as simple and easy as possible for you to order t-shirts at wholesale prices without any extra red tape or headaches. Simply browse our site using the navigation across the top of the site and sub menus on the product pages. When you get to a specific product page, you can click on any color square to see a sample of that item in that color. 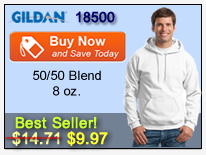 Once a product is selected, choose the colors and sizes and click the Add to Cart button. As you add more products to the cart, you will notice the price automatically adjusting based on wholesale quantity discounts at 12, 36 and 72 of any specific item. When all of the items are added to the cart, click the checkout button and use our secure online order form to complete your order. We accept Visa, Mastercard, Discover, American Express and PayPal. If you need to mail a check, we accept cashier's checks and Postal money orders. 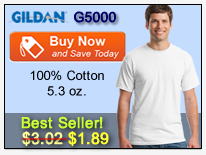 We feature top national brands such as Hanes, Fruit of the Loom, Gildan, Jerzees, Anvil and many more. 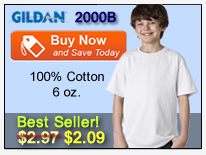 Let us fulfill your need for bulk, wholesale t-shirts. If you have any questions at all, don't hesitate to contact us at support@jonestshirts.com. This experience was great! 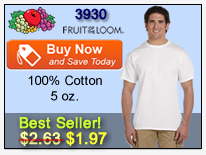 Such a selection of wholesale T-shirts and styles with many sales and the free shipping offer is literally what drew me here. But I stayed because of the quick turnaround time, friendly service, and rewards and discounts they offer to their members. 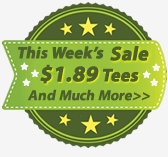 I am thoroughly impressed everytime I log onto Jonestshirts.com, the selection and tiered pricing is exactly what every consumer wants. Additionally, the shipping terms are unbelievable, it amazes me how quickly the product is delivered to my door. Jonestshirts.com is my one and only supplier for one simple reason, RELIABILITY. I placed an order yesterday from your company for the first time. I needed some Jerzees 49M shirts for a softball team that waited till the last minute for printing. I expressed to the lady on the phone that I really needed these in 2 days offering to pay for UPS Blue shipping. She told me if I ordered $89 worth of shirts they would be here in 2 days shipped for free. I received the shirts the very next day by noon. I really appreciate this kind of service and will definitely continue to order from Jones. By the way, I checked several other places before I found Jones and none of them had in stock what I needed. They were too high priced or could not get them to me in 2 days. Thanks again! So far, very happy. The free shipping has been very helpful and a major reason for shopping with you. 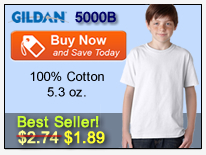 I like the ability to see the wholesale T-shirts in the various colors. Read more from other satisfied customers HERE and see our Wall of Fame HERE.